Please read Important Update ! Hello Friends, we are making a tough decision , we are moving our email Subscription to WordPress jetpack . Due to Financial and Technical reasons we cannot afford our present system, any longer. We will keep reminding you about the change for next few days , and old system will stop by 20th January. We cannot move your email Id’s with out your permission , so you need to re-subscribe, a 30 seconds process. 1. Please enter your email id in the following box. 2. You will see a message saying , success please check your mail. 3. You will get an Email instantly(check spam if necessary) , check YOUR MAIL inbox and click Confirm Follow activate your subscription. Once you click conformation , that will be all , you will receive updates like always , and after few days, we will stop our old system .Thank you for understanding. This is just to explain the process, Most of you know this process, the present emails will stop soon. If you find our blog useful, please do resubscribe and continue your support, it will he a huge motivation for us. Home - Uncategorized - Please read Important Update ! Where is the subscription link? Glad to hear from you… Yes unexpected but good I hope. please enter your mail in the email box in this post or below any post. I will check and tell , just check your mail inbox one more time. confrimation link not working. says the activation link has expired. tried many times. 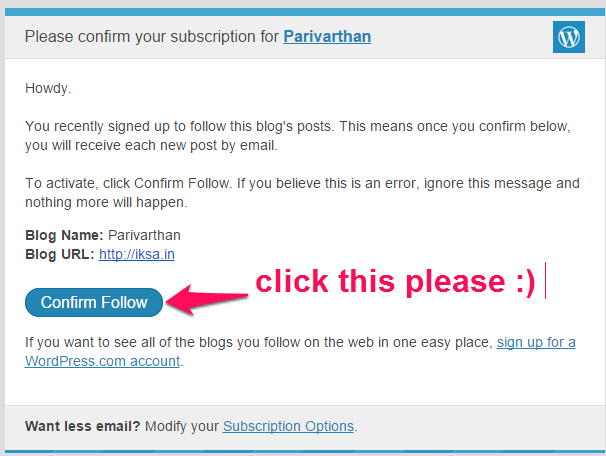 kindly add my email id:: [email protected] to your list of subscribers. sir how is CIVILS DAILY current affairs. Along with standard sources, I prefer Vision IAS material for current affairs,much recommended too. can’t comment on Civils daily. thank you sir,but i have one doubt- Vision IAS current affairs are free or paid?.because i am not enrolled for test series on visionias.if paid where can i get.please help me. Please help. I’m not getting subscribed.